Last week I decided to pick up a new game because I've been playing Muchi Muchi Pork! almost exclusively for the past few months. I really enjoy S. Yagawa's recent games, especially his collaborations with T. Ikeda and other programmers at Cave. So, among the games Yagawa has participated in programming for Cave that are available on the Xbox 360 (Pink Sweets 1.01, Pink Sweets Arrange, Espgaluda II Arrange, Dodonpachi Daifukkatsu Black Label and Akai Katana), I settled on Dodonpachi Daifukkatsu Black Label as my next game to score attack. 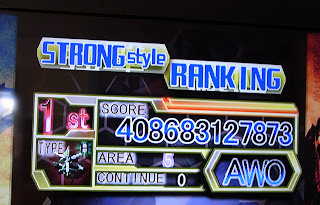 After fiddling with the different shot types, I was drawn to Strong style, as it is the mode that most clearly gives me that distinctive Yagawa feel of destroying enemies, absorbing items, cancelling bullets into items, and dodging bullets that Muchi Muchi Pork! does. (The way the bombs and hypers fill up also sort of feels like a combination of score extends, lard attack refills, and bomb refills in MMP.) I also really like the fully powered shot. In addition, it has little of the "use a hyper and stay in a corner absorbing bullets" that scoring in Bomb and Power styles is based on, and which I find unappealing. When using a hyper in Strong style, you generally have to keep moving in order to score and survive, you have to dodge the fast bullets that spawn from cancelled bullets, and you have to accurately time your Shot presses when lasers get near. This is a really thrilling experience, knowing that with one wrong button press you'll get killed, breaking your chain (which only breaks when you use a bomb or when you get killed while using a hyper). Strong also has the nicest, most complex bullet patterns. At times they remind me of MMP's second loop, or even some MMP first loop boss patterns at high rank. 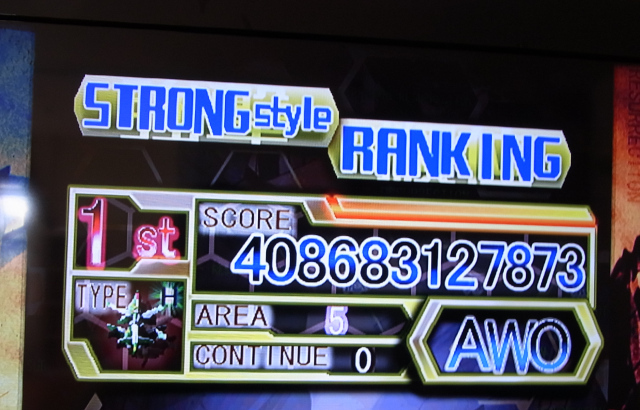 Anyway, my personal best so far is 408,683,127,873, up to the beginning of Stage 5. I was doing well in this run until the Stage 3 boss, where I lost two lives. I lost two more in Stage 4, and quickly crashed and burned at the start of Stage 5. I don't normally use practice modes just because I find it boring to play the same level over and over, but I may have to dig into it to have a chance at overcoming Stage 5, which appears to be massive and quite complex. Anyway, tentatively I am aiming for a 600+bil ALL (no Hibachi or Zatsuza). Once I get consistent at that I'll focus more on expanding my scoring into the 800bil~1tril range.